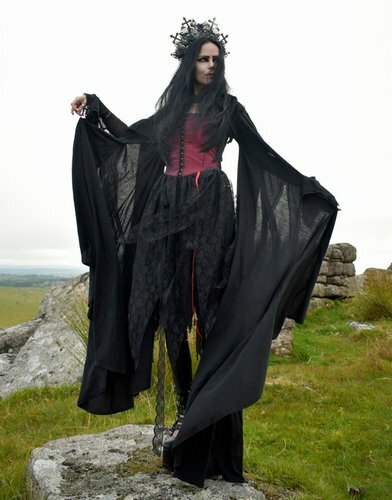 The beautiful Bloodmoon Minidress - only from Moonmaiden!<br> <br> It has a fitted, panelled bodice made from taffeta and steamed velvet, with a steamed velvet back; and a beautiful floaty skirt with various panels of cotton lycra, lace, lace trim, and a finishing ribbon!<br> <br> It's shown here with our Fae of the Falls Bolero, and Haunted Enchantress Gloves. The beautiful Bloodmoon Minidress - only from Moonmaiden! It has a fitted, panelled bodice made from taffeta and steamed velvet, with a steamed velvet back; and a beautiful floaty skirt with various panels of cotton lycra, lace, lace trim, and a finishing ribbon! It's shown here with our Fae of the Falls Bolero, and Haunted Enchantress Gloves.